Aim: To demonstrate that moves up plants which have a transportation system. Materials: Young plants with roots/celery plants, water, hand lenses, razor blade/scalpel, food colouring/dye. 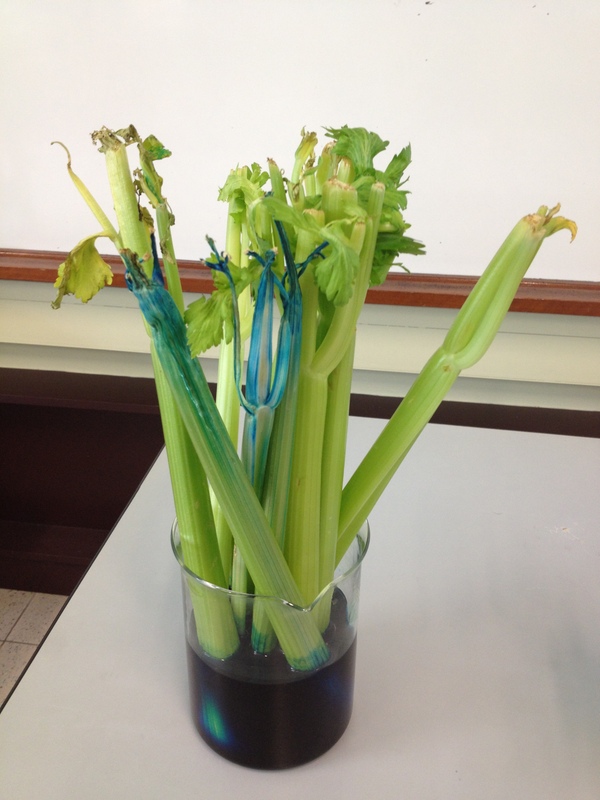 Place the young plant with roots/celery into a solution of water with a dye/food coloring. Look at the tip of the roots through a lenses. You will observe tiny, white, shiny projections which are known as root hairs which absorb water into plants. Observe the colour of the plant closely over a number of days. Cut a section across the stem of one of the plants after a number of days. Draw the cross section of the stem. The leaves change colour adopting the colour of the dye. Celery stem after cutting with a scalpel. There are coloured tubes within the stem showing conduits that transport water up to the leaves. There are tubes/pipes/conduits in plants that transport water from the roots up to the leaves.